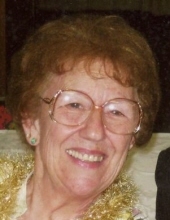 Eileen Marie Hoffmann (nee Schellinger) 86, from the Town of Saukville, peacefully entered into the kingdom of Heaven to be with her Lord and Savior Jesus Christ on April 10, 2019, at Kathy Hospice in West Bend from complications of a stroke. Eileen was born in Hartford on September 22, 1932, to Arthur and Natalia (Schoebel) Schellinger. She grew up working on the family farm, babysitting nieces/nephews, and spent 42 years working at the West Bend Company. It was there where she met her future husband Marvin O. Hoffmann. They were married on June 9, 1956 in St. Lawrence. Eileen and Marvin were blessed with four children and raised them on the Hoffmann family homestead in the Town of Saukville where they farmed for many years. Later in life, they were able to enjoy travels throughout the US and Europe. Eileen also traveled to Australia, New Zealand, Japan, Hong Kong, Philippines, and Costa Rica. Eileen enjoyed giving of her time, talents, and treasures. She spent many years volunteering as a 4-H Leader in cake decorating, the Ozaukee County Dairy promotion committee, and the WI Farm Bureau. She was recognized for her work to increase membership and received the Farm Bureau woman of the year award. In retirement, she also volunteered at the local food pantry, the Saukville Landt/Thiel Legion Post #470 Auxiliary, and driving cancer patients to their treatments. Through her church, Eileen chaperoned several mission trips to Ohio and other states. She enjoyed raising chickens, gardening and collecting precious moments. Eileen was full of energy and enjoyed life to the fullest. She taught her children the value of hard work, perseverance, and to strive for excellence. Eileen is survived by her devoted and loving husband Marvin of West Bend and children: Deborah (James) Senn of Campbellsport, Margaret (Dean) Schoessow of Mequon, Thomas of Saukville, and Marvin J (Kate) Hoffmann of West Bend. She is further survived by 15 grandchildren: Therese (Jeremy) Keifenheim, Theodore Senn, Travis (Bethany) Senn, Kimberly (David) Rusch, Andrew (Elizabeth) Schoessow, Matthew Schoessow, Michael (Samantha) Schoessow, Bridget, Garrett, and Brent Hoffmann, Amy, Nicholas, Rebecca, Margaret, and Fritz Hoffmann. 4 great-grandchildren: Clara, Levi, and Kolby Rusch and Savannah Senn. Brothers, Franklyn and Eugene (Mary Lee) Schellinger. Sisters-in-law: Mary Ellen Hoffmann, Darlene (Eugene) Weyker, many nieces, nephews and dear friends. Eileen was preceded in death by her parents, Arthur and Natalia Schellinger, mother and father-in-law Henry Sr and Julia Hoffmann, great-granddaughter Lena Rusch, siblings and in-laws: Victoria (Walter) Theisen, Ralph (Joan), Florian (LaVerne), Bernard (Charlene) Schellinger and Sigrid Schellinger. Brothers-in-law: Henry Jr, Raymond, and Robert Hoffmann. The family would like to thank the the staff @ Kathy Hospice for the loving care of Eileen. In lieu of flowers, memorials may be given to the Ozaukee County 4-H Foundation, Kathy Hospice, or Holy Trinity Catholic Church in Newburg. Visitation will be held at Holy Trinity Catholic Church at 521 Congress Street in Newburg on Tuesday, April 23, 2019, from 3-5pm followed by Mass of Christian Burial at 5:00pm. Interment will be Wednesday, April 24, 2019, 1:30pm at Holy Trinity Catholic Cemetery. To send flowers or a remembrance gift to the family of Eileen M. Hoffmann, please visit our Tribute Store. Guaranteed delivery before Eileen's visitation begins. Guaranteed delivery before Eileen's service begins. Guaranteed delivery before Eileen's graveside begins. "Email Address" would like to share the life celebration of Eileen M. Hoffmann. Click on the "link" to go to share a favorite memory or leave a condolence message for the family.